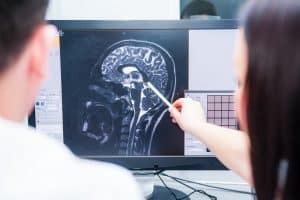 Researchers believe that children and young adults between 3 and 29 years-of-age are four times more likely to develop a traumatic brain injury if they have attention deficit hyperactivity disorder (ADHD) than if they don’t. The study examined insurance information on 72,000 people with ADHD and in that age range, against a control group of people the same age who did not have ADHD. The participants were followed through 2011. About 10 percent of the youth with ADHD also had a traumatic brain injury, compared to 2.2 percent of the ADHD-free children, teens, and younger adults. The precise ratio of ADHD to non-ADHD TBIs was 4.6 to 1. The study did not examine why ADHD might be a contributing factor to traumatic brain injuries. The study’s author, Dr. Dr. Mu-Hong Chen, of Taipei Veterans General Hospital in Taiwan, speculated that children with ADHD might not pay attention as much when they’re driving or bicycling. He also theorized that youth with ADHD might be less cautious when playing sports or participating in other activities. According to the Journal of Adolescent Health, worldwide, about one in 14 children and teens, and one in 50 young adults, have ADHD. Whether ADHD treatment can reduce the risk of brain injuries has not been determined. Dr. Jack Tsoa, who worked on the study as a Tennessee Health Science Center neurology professor (and a professor at the Memphis Veterans Affair Medical Center) said that “It is not clear if traumatic brain injury causes ADHD which then leads to repeat TBI or whether having ADHD puts a child at risk for behaviors which increase the risk for sustaining a TBI.” Dr. Tsoa did indicate that early medication use by ADHD patients could help minimize various TBI risks. At the Rocky McElhaney Law Firm, our Gladiators in Suits have been fighting for TBI victims for years. We have a strong record of track success and our respected by our legal peers because we have the experience, resources, and tenacity to prove fault and the need for long-term health care. To discuss your case with a caring Nashville TBI lawyer, please phone us at 615-246-5549 or compete our contact form. We have law offices in Nashville, Hendersonville, and Knoxville, and fight for injury victims throughout the state.